Estroven Plus Energy Menopause Supplement, 40ct Review: Is It Good? 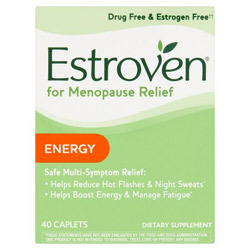 Estroven Plus Energy Menopause Supplement, US $22.49 for 40 caplets, is a dietary supplement is specially formulated to relieve multiple symptoms associated with menopause. i-Health, Inc. is a consumer packaged goods company committed to delivering supplements and other over-the-counter products that promote the health and well-being of its clients. It has formulated several supplements intended to ease the many menopausal symptoms of women. Take 1 caplet of Estroven Plus Energy Menopause Supplement once daily after a meal, ideally after breakfast. Supplement must be taken for a minimum of 60 days for positive effects to become evident. The manufacturer has guaranteed that this product has been tested for quality & purity in the USA. Estroven Energy is not formulated with synthetic estrogen and has no preservatives, yeast, wheat, gluten or lactose. Based on the 2015 Pharmacy Times OTC Survey, Estroven is the Number 1 brand recommended by pharmacists. Estroven menopause supplement reviews reveal that it took women at least 60 days before the positive effects of this supplement was felt and became obvious. This product is formulated with soy which consists of plant-based estrogen that has been associated with the disruption of endocrine functions, infertility, breast cancer and thyroid cancer. Estroven menopause supplement reviews reveal that some women do not respond well to this product and continued to feel their menopause symptoms with the same level of intensity and frequency even after taking this product regularly for 60 days. Estroven Plus Energy Menopause Supplement can be a helpful ally in your attempt to survive menopause with grace without getting in the way of your productivity. The soy content of this supplement, however, is a major drawback and, if you are actively avoiding soy for whatever reason, this product does not suit you.